St. James kicked off another school year in August and the first Mass our students attended was August 30th. It is good to remember the St. James school mission: We are called to grow spiritually, intellectually, emotionally and physically as members of our school, parish and the greater community. By combining our Catholic beliefs, strong academics, Christian service, liturgy and prayer, we will become people of faith and lifelong learners who serve the broader community. As we start a new school year we want to acknowledge our students who graduated in May. They completed their years at St. James with a celebration on May 31st. 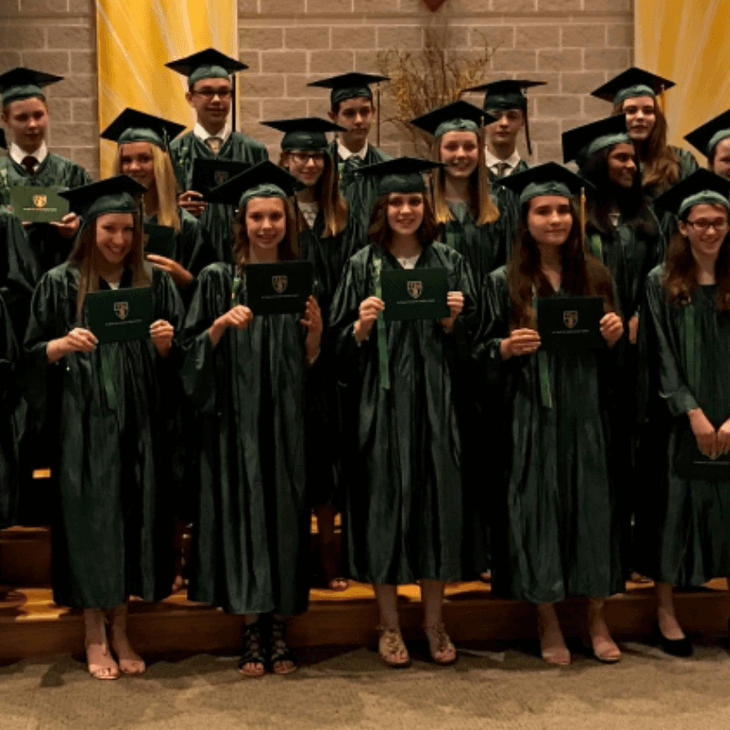 During their years at St. James they not only grew academically, they also learned many lessons on faith making their confirmation in May as well as their other sacraments of initiation (Confirmation, Eucharist) on their journey. We celebrate that they are well prepared for the next phase of their life of high school and beyond. The foundation is well set for their lifetime as Catholics. Over the last four years approximately 60% of our graduates have moved on to local Catholic high schools. Feedback from the high schools both Catholic and public are they can pick out the St. James students in their class as they are well prepared to succeed academically. At St. James 5th through 8th graders can participate in four different inter scholastic sports. In the fall, our students compete in Cross Country in the Suburban Parochial League and Volleyball in the DuPage Parochial League. Our students can learn the value of competition and teamwork while having fun. Come out and support our students at volleyball in our newly updated gym. Home Volleyball games most weekends through Mid-October.